Is animal testing necessary, or even effective? That animals suffer in such research is beyond question. The clinical reports detail a massive catalogue of misery. Removing parts of the brains of marmosets and depriving them of food and water to ’research‘ Parkinson’s disease; millions of mice ’given‘ cancer by poison, irradiation, injection with tumours or genetic tinkering; dogs with their coronary arteries tied off to ’simulate‘ heart attacks by attempting to mimic the fat-laden arteries from which humans suffer and animals naturally do not. Advocates for animal testing claim that it’s a trade-off: we need some animals to suffer in gruesome ways so we can find a cure for this or that serious disease in humans. But however appealing this mantra may be to the general public, it is completely untrue. The experiments are almost always futile and tell us nothing we did not know already or could not have discovered by other means. Neither should we think it strange when Animal Aid declares that animals are poor surrogates for people. It is obvious that there are significant, intractable inter-species differences. Even more worryingly, there is a wealth of evidence that animal experiments are at best delaying medical progress, and at worst making medical practice positively dangerous. Thirty-six states in the U.S. allow stray dogs and cats to be sold to research facilities if they are scheduled for euthanasia at animal shelters. Read more here. 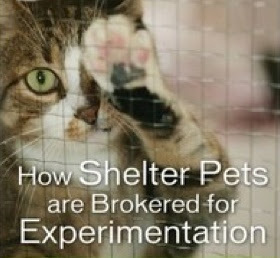 For more about World Day for Animals in Laboratories, click here.